Intermediate Revit classes are forming now. Save 10% when you Pre-Register for the next Intermediate Revit Architecture class by submitting your information below. Once we have 4 or more attendees pre-registered we’ll schedule dates for the class, provide you with your discount code & payment link. Once dates are chosen we’ll open the class up to additional attendees at full price. Classes are 9-5 each day. Class size is limited to 10 attendees with average attendance of 7-8 people so you get personal attention and all your questions answered. Computers are provided but you can bring your own if you prefer. Snacks and refreshments are provided (You are on your own for lunch). Each attendee gets a certificate of completion and our exclusive “Class Notes & Key Takeaways” handout plus a coupon code for 50% off myCADD Revit Families. Free Retakes!! - As long as our classes aren’t full, attendees can retake any class within 12 months free of charge. Objective: The goal of the Intermediate Revit course is to build upon the foundation Introduction to Revit course, with additional modeling tools, some customized modeling features, and introduction to model organization & management skills. After attending this course students will be able tackle some of the more complex modeling geometries, and better manage their models. 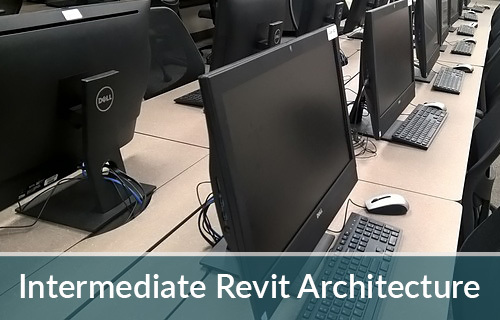 Ideal for architects, designers, and intermediate users of Revit Architecture. Cost: $695 per student, due when the class is scheduled. 2 or more registrants together saver 10%.